Howdy, folks. This here’s an excerpt from my Western yarn ‘Blood on the Ground’, which you’ll find in the rip-roaring anthology ‘Soul of the Universe’. Folks who know about these things reckon it’s as fine as cream gravy, or “a stunning collection” as they put it. The protagonist, Rence, something of a chancer and a ne’er-do-well has sneaked into an Indian camp in order to purloin whatever the hell takes his fancy. The next tipi was the same: a right lot of clutter but little of value. He did pick up a beautifully decorated stick, some three feet long. It was decorated with odd carvings, notches and feathers, with an eagle claw fixed to one end. He figured that he’d likely manage to sell it for a pretty price to some unsalted dude visiting from the East, and slipped it into his bag, tying a beaded decoration to the bag-strap so that the stick would not fall out. He was readying to move on to the next tipi when he heard loud female laughter from outside. He threw himself into a dark corner, hastily pulling up a blanket to cover himself and hauling his boots under it. Four laughing Crow women ducked into the tipi, yammering away nineteen to the dozen. The woman at the rear, a little older than the rest and ugly as a mud fence, said something in Crow that caused her companions to burst into wild laughter. She reached down and caressed the buttocks of the young girl nearest to her, who smiled. The two other women approached the pair and stooped to lift Plain Jane’s dress over her head. She swayed naked in the dim light. Rence stifled a gasp. Although her face looked like the hindquarters of bad luck, her body was something else. He stared for a spell while kissing and, well, other things went on. Then, as much as he wanted to stay and watch the other women get unshucked too, he got set to make tracks. He was not such a fool as to ignore such an ideal opportunity to leave undetected. He edged quietly towards the entrance, silent as a bone orchard. Silent, that is, until the purloined stick poking out of his bag clattered against a large pot. You can buy ‘Soul of the Universe’ from Amazon US, Amazon UK, Amazon Canada… hell, every kind of Amazon you can think of. If you’ve read the newly-released anthology, “Soul of the Universe”, you’ll know that it features a new story of mine: a Western yarn. Now, I’d never considered writing a Western before, although I can tell you that Anthology Club has a possible Western-themed Anthology lined up, so I certainly will revisit ‘cowpokes’ and ‘injuns’ again. So what inspired me to enter the strange new world (to me) of the cowboy? Last year I was gripped, along with (although later than) most of the rest of you, by the stonkingly good telly series Breaking Bad. The final episode featured the song ‘El Paso’ by Marty Robbins. Chasing down this earworm on YouTube, I stumbled across Rex Wells singing “Blood on the Saddle”. Something about the song spoke to me. Who was the unnamed cowboy, and how did he come to be lying on the ground ‘all covered in gore’? The song’s explanation that a horse had trodden on his head seemed patently ridiculous. OK, so maybe (so my thoughts went) the singer reporting the event was trying to cover something nasty up. But what could that be? It didn’t take me long to work out an alternative, far more interesting explanation. Now I needed a setting that was slightly askew from normal Western tales, to match the invented event. Two things led me to set the tale above the snowline – the first was my love of the film Jeremiah Johnson, the second was the evocative image of hot blood splashed on stark white snow. Of course, once I had snow, I had to have the Crow, and not only for reasons of rhyme. Looking into the Crow led me to Pine Leaf – that’s her, over on the left there – and everything else slotted into place. All of the main parts of the story, therefore, led from thoughts originally sparked by listening to this song. Which is the whole raison d’etre of the anthology, after all. Buy the book in these places: Amazon UK, Amazon US or Smashwords. I am delighted, nay elated, to announce that “Soul of the Universe” is OUT NOW! I am as excited as a bottle of Dandelion & Burdock that has seen shaken very hard. Editing this musically-inspired collection has been a hatful of fun and a barrowload of work. It’s also been a bus ride of discovery, and I have learned a lot about myself as an author, things that will only help me to improve. Things like avoiding idiotic metaphors like ‘a bus ride of discovery’. 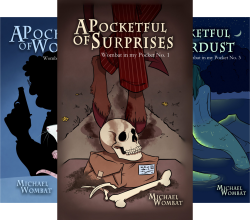 Now, yes, there are a couple of my stories in there, but I’d rather tell you about the superb tales that you will find from my fellow authors, some of the most talented indie writers around. First up is a science fiction story from the delectable Michael S. Manz which has a delightful skew that will have you chortling into your cornflakes (if, that is, you eat cornflakes while you are reading). Add to this a brace of emotionally exercising tales from Michael A. Walker that will make the hairs on all sorts of body parts stand on end and you begin to realise that you hold something special (no, not that, I mean the book). Finally, bucking the wave of Michaels that is threatening to overwhelm the anthology world, the beguiling Marissa Ames crowns this marvellous collection with a thumpingly thrilling story set in the world of Tir Athair, familiar to all readers of her hugely successful medieval fantasy novel Minstrel. Please do click on any of the names above to discover their own thoughts about this remarkable gathering of new worlds for you to explore through your reader. All of these stories are hand-picked for your enjoyment and lovingly wrapped in a cover by exciting new illustrator Kit Cooper that I could wax lyrical about for paragraphs, and probably will in a future blog post. …until “Soul of the Universe”, when you will be able to find out what this woman has to do with my story. It is my immense pleasure to present to you the splendid cover for my new book, “Soul of the Universe”, which will be available to buy on March 18th. I feel properly proud that it has been chosen as the first book to be published by Anthology Club, a growing collective of writing talent that has been causing something of a stir, and is predicted to become quite the thing over the coming months. Already Anthology Club have eight further collections in the works. I’m sure that from that you can work out that all of the stories in this book are inspired by music. Each story has a YouTube link to the song that inspired it, so that you will be able to listen as you read. I’ll tell you more, and introduce you to the individual authors, over the next few weeks. For now, let us just bathe in that glorious work of art up there, and the many symbolisms therein. From the design, can you guess what genres are represented in the book? Go on, have a wild stab and tell me in the comments. The cover was commissioned from a young artist named Kit Cooper, who was told the theme “Music is the soul of the universe” and nothing else, and given the seemingly impossible task of interpreting that theme. Now, I may be biased – hell, of course I’m biased – but I think Kit did an incredible job.